now before i go and start installing everything i have a couple questions. I know this kit is designed to be run on stock internals and the psi is set at 5, i plan to leave it at that untill i build by other motor up. The questions i have are the kit is ment for 92-95 honda civics and i have a 97 el. I know everything will bolt up, the only problem im thinking i will run in is with the fuel control box (greddy blue box) could i used the blue box i have and run it on my 97 EL just by following the proper pin out. For instance injector 1, injector 2, injector 3 injector 4 i know the wiring will be difrent from 92-95 civics could i find the proper injector 1 spot on my el ecu and solder the blue box wire to it? Same for injector 2, injector 3, injector 4. Also comes with map sensor wire as well..
What im trying to say is could i use the wiring diagram supplied for 92-95 civics and connect it to the 97 El ecu by proper pin out .. Ill have pics later on to show exactly what im talking about its kind of hard to explain in words. Pics work much better..
Any help would be great or even diagrams. i wouldn't use the greddy emanage anyways....just convert to obd1 and get tuned with crome. Crome is much better than emanage. hey andrew i alredy have a chip set with everything alredy tuned for d16z6 motor which came with the turbo..Its programed..
well, you've got a d16y8, not a d16z6, its completely different, especially the timing values. Too much timing on a boosted motor can put you in a lot of trouble, real quick...and the y8's don't like a whole lot of timing. 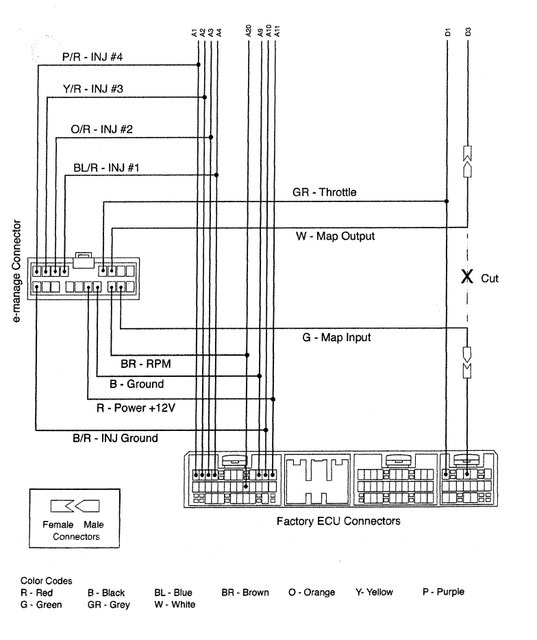 So, get an obd2a to obd1 conversion harness and obd1 ecu, then use your "chip set". But why are you asking about the blue box if you are planning on using a chipped ecu? Its the simplest chepest route right now i have both the blue box and chipset for d16z6.. I plan to use the blue box because its alredy set to factory specs..
You know how to hook up the blue box? Does anyone have directions on hooking up the blue box? it wont be simple when you have to pull the motor and replace it. If you came here looking for help and guidance, you are getting it. DITCH E MANAGE and street tune it with crome. There is no if's ands or buts, its either you do it and have a reliable, healthy motor, or you hack it up with emanage and risk detonation or running way too rich which can spin bearings, premature wear, etc. maybe e manger is difrent from FCU (fuel control unit) I have the fcu..
All i wana know is how to hook up the FCU to 96-98 civic right now which is alredy tuned for this turbo setup.. This is a basic turbo setup offered by Greddy. Later down the road yes i will go obd1 and let Andrew street tune it. But for now i just wana know wich wire is for Injector 1 , injector 2, injector 3, and injector 4 also the map sensor someone with diagram would help me out alot..
P.s. its a d series who cares if a blow it lol..
Search up obd2a ecu pinouts on honda tech. They list which wire is what there. how much power does that kit make and at what psi? for who ever else ever needs this..
Whats the difrence between FCU and Emanger. I know fcu is for 92-95 and emanager for 96-98 could i use Fcu on 96-98 cars? ive already started building my own u know that..